What followed was not only a set for the ages but also the next stage of Notaro’s career. She’d been doing stand-up for years, but her performance at the Largo led to the release of her first album, Live, a book deal, and an HBO comedy special. Notaro went on to develop her first TV series, the effortlessly charming One Mississippi, with Diablo Cody. All of those projects are tinged with sadness, but heartbreak is just one of the hallmarks of Notaro’s work. She’s also an exceptionally gifted storyteller, capable of creating distinct characters and tying together the most disparate of threads in just minutes. Never has that quality been more on display than in Notaro’s new special, Happy To Be Here, which is an hour of joy, triumph, and the subversion of expectations. Notaro directed the intimate and deceptively spartan special, which was shot in December 2017 at Houston’s The Heights Theater. Her introduction—“Happy to be here”—seems miles away from her stunning Largo opener, but it’s just as honest. The comedian is clearly excited to be performing in Texas after 10 years, having grown up in the town of Spring. But Notaro’s also reveling in married life and parenthood, which she explores in bits about late-night conversations with her wife, actor-writer Stephanie Allynne, and the antics of their twin sons. There are jokes about temp jobs and communicating with cats and being misgendered, delivered in typically wry and observational fashion. But Notaro is all smiles throughout, frequently bantering with the audience. There’s a lot of interaction with the crowd, but her rhythm remains unbroken; Notaro just works the occasional gasp of shock or skepticism into her act. Notaro maintains this great back-and-forth throughout Happy To Be Here, throwing out seemingly unrelated questions and premises, and accepting the eager responses. The whole thing is exhilarating; the audience is eating out of her palm, even as several minutes lapse between setup and punchline. Early on, Notaro, who once worked as a temp, relates a story about her worst assignment. Every new reveal from the comedian is followed by some guess from the crowd, which then becomes part of the bit; it’s one of several instances in which Notaro’s stories snowball, gathering and discarding punchlines. But she’s not testing out material—she’s turning their expectations on their heads. Notaro knows everyone’s waiting (or worried) for the story to get worse, whether the setup is foreboding or innocuous. 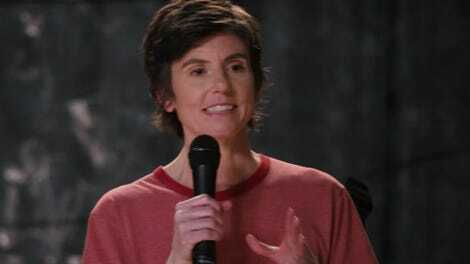 Her deliberate delivery and joke structure build the anticipation, so that we never know if we’re about to hear about another terrible day in the life of Tig or exult in her experiences as a new mother. The result is not quite misdirection, but it is magical and even bold. Although her past tribulations continue to inform her comedy, Notaro commits to the present—and the future—in Happy To Be Here. She trusts that we know enough about her past not to ask her to wallow in it; and, as sublime as her grief is, Notaro proves there’s so much more to her comedy than tragedy. Her happiness doesn’t blunt any of her humor, and it also provides a fitting end to Notaro’s unofficial trilogy. If Live marked her lowest point, then the giddy-in-comparison Boyish Girl Interrupted declared Notaro’s intention to fight back. Happy To Be Here is both the fulfillment of that promise and Notaro’s reward.